Harlan Coben’s propensity for writing thrillers that keep you turning the pages hours after you meant to turn out the light continues with Don’t Let Go, a standalone novel set in the world of fan-favourite protagonist Myron Bolitar. Nobody’s ever been able to explain what Leo Dumas and his girlfriend, Diana Styles, were doing on the railroad tracks the night they were killed by a train, or why Maura Wells, girlfriend of Leo’s twin, Napoleon, “Nap,” disappeared that night. They’re questions that have haunted Nap for more than a decade, and have shaped the way he has lived his life: isolated, an avenging angel of a cop who isn’t afraid to break (or bend) the rules of law to enact his interpretation of justice. Indeed, Don’t Let Go is told almost entirely from his perspective, Nap relaying events to his dead brother, as though he’s listening. It’s clear from the very beginning: Nap hasn’t forgotten what happened that night, and it’s still affecting him today. He is determined to find the truth, to uncover what truly happened that night, and understand how those events connect. When Maura’s fingerprints are discovered in a car driven by a murdered Pennsylvania cop, sergeant Rex Canton — also one of Nap’s high school classmates — Nap immediately inserts himself into the investigation. When Hank, another classmate, is also found murdered, Nap realises the connection between everyone: at school they were members of the Conspiracy Club, who spent much of their time sussing out the true purpose of the secret military installation in town. Obvious conclusion: they uncovered something, learned something they shouldn’t, and now they’re being hunted down. But if that’s the case, why wait fifteen years between murdering Leo and Diana to now target the others? Nap knows he’s missing a vital piece of the puzzle, and to find the answer means delving back into his painful past. One of the great thriller writers of our age, Harlan Coben’s clever, fast-moving and multi-faceted yarns always demand to be read in one sitting. Don’t Let Go is no different. This is an exhilarating and unputdownable novel that asks whether the truth can really set you free, and whether some secrets are better left buried. More impressively, it’s a pacy thriller with a romantic heart, never once threatening to become overly sentimental. Coben’s gift is his ability to handle all the elements of a great thriller — a thrumming, zig-zagging plot, sharp dialogue, empathetic characters — with inimitable brio. Don’t Let Go is the work of a consummate storyteller. I slipped into hyperbole earlier this year when I reviewed Harlan Coben’s Fool Me Once. Deservedly so, upon reflection. I stand by it. This isn’t an apology for my extensive praise. Nor is this review what you’re possibly expecting: “but wait, his latest novel, Home, is even better!” No, when juxtaposed, Fool Me Once is certainly the better thriller. It’s got that brilliant final twist, which hasn’t been topped by any other novel I’ve read this year, and certainly validates Coben’s ranking as the consummate master of the modern day thriller. That’s right. He’s not just a master. Anybody can master something. But to be a consummate master? Wowzer. But – and forgive the obvious pun – there is something special about coming home. About reuniting with a cast of characters you haven’t read about for some time. Myron Bolitar and Windsor Horne Lockwood III are two of my favourite characters in all of fiction, and we haven’t seen them (besides brief appearances in Coben’s YA Mickey Bolitar trilogy) since 2011’s Live Wire. 2011, guys and gals. That’s five years ago. God, we were do damn young. And look at us now. No, don’t – – ! Home brings these characters back, alongside the classic cast: Esperanza; Big Cyndi, Myron’s parents. Heck, even the kids wh0 starred in Coben’s YA series play a vital role in proceedings, and it’s great to be reunited with Mickey, Ema and Spoon. Their presence adds a cool continuity to things. So, sure; this book is for the fans. The readers, like me, who clamour each and every year for a new Myron novel. But there’s plenty here for “non-Myron” fans to enjoy. If indeed there even are such people out there. The premise is straightforward: 10 years after two 6-year-olds vanished from a suburban New Jersey home, one of them is spotted in London. Obvious question: where’s the other? Myron gets involved because one of the kids, Rhys – – the boy who wasn’t spotted — is (or was) the cousin Windsor Horne Lockwood III, Myron’s best friend, and the friendliest psychopath you’re likely to encounter. In the past it has always been Myron’s lust for justice – – for righting wrongs, for doing the supposed right thing – – that pulled Win into deadly situations. This time the shoe is on the other foot. Win has always been there for Myron. And despite his pending marriage, Myron will always be there for Win. That’s the bro-code, didn’t you know? Yes, there’s a big mystery here, and there are surprising twists (unleashed rather late in proceedings, admittedly, but no less effectively than in other novels) but it’s the emotion of the characters that really lifts Home above the rank and file. The heart and soul of this novel are the twin families coping with the loss of a child, and the extremes parents go to in order to protect them. Ultimately, it’s just great to be back with Myron and the gang. The novel’s ending is possibly conclusive – – with a real lump-in-the-throat moment – – so who knows when we’ll see these characters again? In many respects, I wish I’d taken my time with the novel and truly savoured it. Instead, I smashed through it in less than 24 hours. That’s the true evidence of Coben’s class: his books are so gripping, you can’t put them down. Forgive me for throwing out this hackneyed phrase — but Fool Me Once is a world-class thriller. I mean, seriously; just when you think Harlan Coben has reached his apex, when you’re thinking there’s no way he can beat what’s come before, he produces his best, most compulsive novel yet. Shudder in fear, fellow thriller writers; Coben has set the bar stratospherically high this year. As always, Coben’s latest is peopled with believable characters thrust into seismic situations.Fool Me Once stars Maya Burkett, a former special ops pilot, home from the war, and suffering from PTSD following a decision she made in combat. This is a woman who has been through much in recent years; the death of her sister, and more recently, the murder of her husband, Joe. Despite that – her festering demons – Maya is determined to stay strong for her young daughter. So when she glimpses her dead husband on a nanny-cam just two weeks after his death, the familial normalcy she is striving for threatens to completely unravel. Maya finds herself digging deep into the past, uncovering the shocking truth about her husband and the kind of man he really was — and the kind of woman she is. Coben’s mastery has always been the blindside; the plot-twist readers never see coming. I consider myself a ‘veteran’ thriller reader (see this patch I sewed onto my jacket?) and particularly gifted at predicting these dramatic zigzags (I am waiting for Professor X to sign me up to the X-Men, because I consider this my mutant power). But the grand finale here shocked me; it rocked me to my very core. I turned the final pages with my mouth agape, disbelieving, but believing at the same time. Because this is a twist that doesn’t feel contrived; it makes sense. It’s like an awakening; the journey up until now takes on a completely new meaning. If my reading stack wasn’t already threatening to topple and crush me in my sleep (why couldn’t my mutant power be invincibility?!) I’d re-read Fool Me Once with this new mindset. Sure, it’s a little humourless at times — occasionally I’d find myself missing the Myron Bolitar’s one-liners (although a recent Tweet suggests we’ll be reunited with that old favourite soon) and the zinging dialogue of some of Coben’s wittier protagonists — and the novel takes slightly longer than usual to kick into high gear; but the build-up is worth it for that gut-punch of an ending. With Fool Me Once, Harlan Coben has once again proved to be the consummate master of the modern day thriller. I know better than to assume he won’t one-up himself next year. The Stranger examines the fragility of the American Dream; how the perfect life can be founded on a lie, and how its disclosure can decimate even the most durable family ties. The Stranger has been operating for many years. He appears out of nowhere, when you’ll least expect it; during a High School lacrosse game; while you’re at the grocery store; a night out with the girls; during your Sunday morning coffee. You won’t know who he is, and you won’t know why you trust him – but you do. Because his revelations are undeniable. His truths are catastrophic, and will shake the foundations of your happy life. And before you can ask any questions, before you can seek guidance, he is gone, stumbling on the crumbling remains of your world. Who is the Stranger? Where does he get his information? And how does he benefit from these disclosures? Adam Price is the Stranger’s latest victim. Living a content life – happily married, father of two boys, successful career – this is a man who is cruising through life. He has accomplished what the majority strive for. Then the Stranger whispers a devastating secret into Adam’s ear, about his wife, Corrine, and Adam’s perception changes. He hasn’t been living the American Dream; instead, a nightmare cruelly masquerading as that ideal. Upon confronting Corrine, she soon disappears, forcing Adam into a dark, deceptive world, rife with conspiracy and violence. Because everybody has secrets, and some will kill to protect them. Coben keeps the pot at full boil, lacing his story with plenty of suspense and intrigue until the satisfying gut-punch ending. 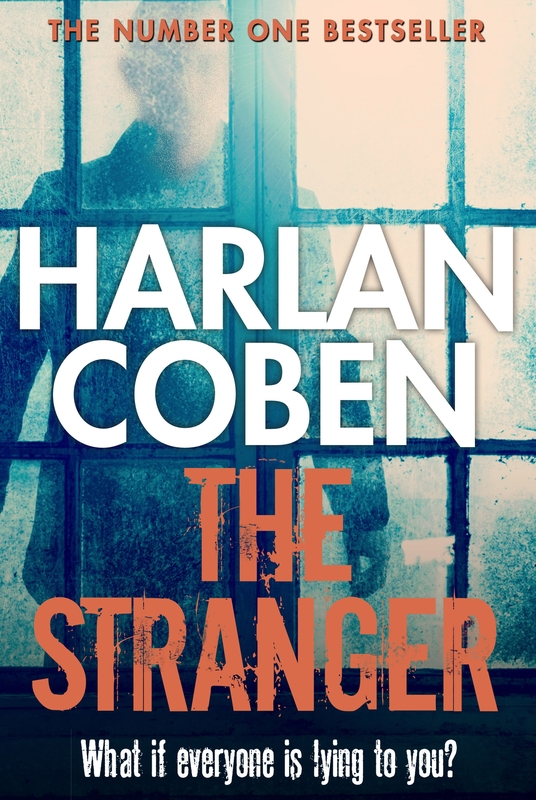 Wilily plotted, swiftly paced, and sprinkled with the author’s trademark mordant wit, The Stranger is Harlan Coben in top form.